Proton has announced that it will extend its partnership with Petronas, whereby the latter will develop and supply lubricant products and functional fluids to the national carmaker for a period of 10 years, effective January 1, 2019. “Proton and Petronas have a long history of working together so it was only natural for us to extend our partnership. Proton has a lot of exciting new models in the pipeline and we are eager to explore technical solutions developed together with Petronas that will benefit our customers,” said Li Chunrong, CEO of Proton. 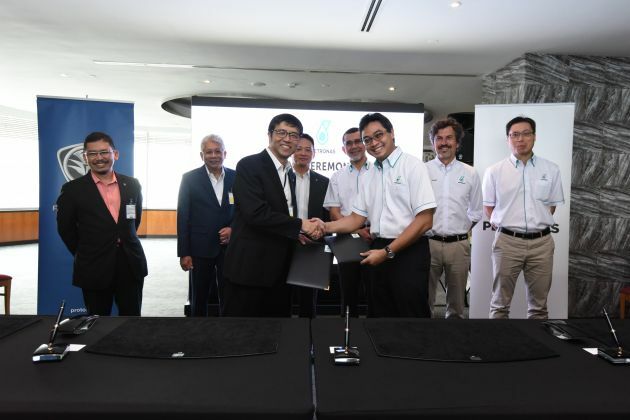 With the continued partnership between both companies, Petronas will supply a range of products for Proton’s factory fill and aftersales services, which includes the Petronas Syntium SE (which stands for “Serviced at Edar”) range of engine oils. The range consists of three lubricants, the fully-synthetic Petronas Syntium 3000 SE 5W-30, the semi-synthetic Petronas Syntium 800 SE 10W-30 and the Petronas Syntium 500 SE 15W-40 mineral engine oil. These products are compatible with the 10,000 km service intervals of all new Proton vehicles. “Petronas has been the official fluid solution provider to Proton since 1989. We are delighted to take the partnership further as this is a clear testimony of Proton’s trust and confidence in our products and services,” added Datuk Sri Syed Zainal Abidin, managing director and CEO of Petronas Dagangan Berhad (PDB). Tahniah P1! Working with gud partners like Petronas, even Mesidis AMG wins F1 thanks to Petronas contribution. Together P1, Petronas, Mesidis, and Geely may be diff company but all are synergising and working towards a common goal. Bravo! Can somebody explain to me …Why Proton no more exits in South Africa..Why they did not inform the costumers they gonna close all branches in R.S.A..Who took over the servicing n parts..It’s very hard to find parts for this cars now..I’ll never by a Pronton again nor Geely or any other strange brands…I’ll stick to what I know VW/ Toyota etc..
Lol. In South Africa, the only cars popular there are Peugeots and Renaults. I don’t think you ever step foot in South Africa. I don’t think you are who you say you are. No conflict of lubricants supplier? Geely in China exclusively using Shell. Hope there is no lawsuits especially if Proton going to bring in more Geely based models. There is no conflict. It’s not Geely that are selling Proton cars, it’s Proton. Shell supplies to Geely, not exclusively for Geely made engines. geely is geely, proton is proton. why would there be lawsuits? Proton had the best times with Mitsu engine. Datuk Sri Syed Zainal was the Proton CEO. Now he is CEO for Petronas Dagangan Bhd. Unfortunately, he was kick-out from Proton after DRB Hicom fully owned the shares. How amazing is this photo ?! DS Syed Zainal Abidin and Li Chunrong together, shoulder-to-shoulder. Both carry/carried the same burden, both work/worked hard to steer Proton on track. Truly, two legends in Proton’s 35 year saga. where did you get the figure “billions” from? If i remember correctly, Proton bought the engine over from Petronas for around RM63million as reported in the news. “Development was paid for by PETRONAS” before that. besides that… what is your point in bringing up old news? Next Post: Audi S6, S6 Avant, S7 Sportback – 3.0L V6 TDI gets 48-volt system, electric compressor; 349 hp & 700 Nm!